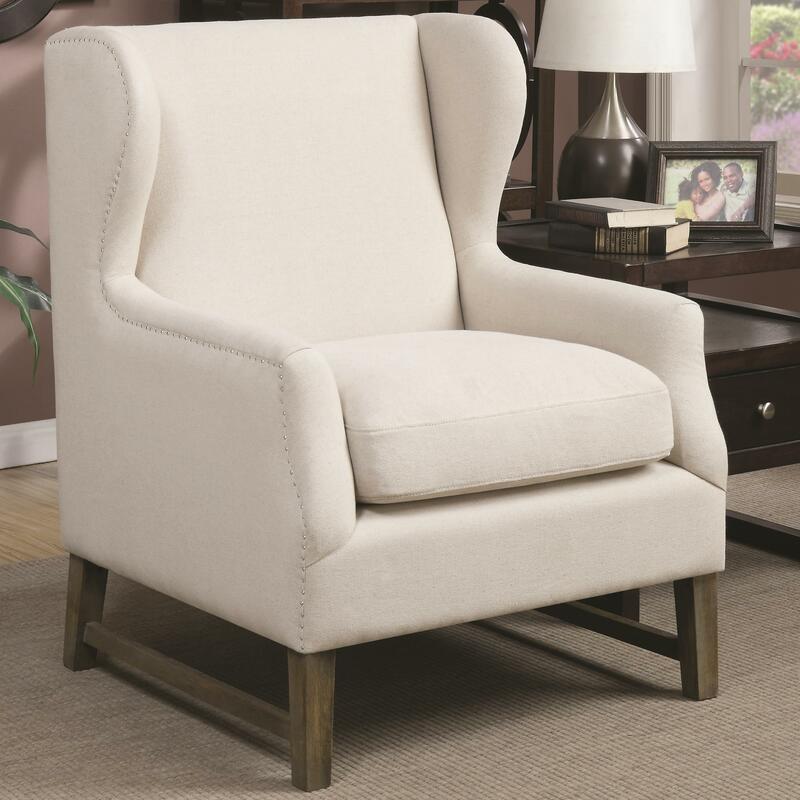 A simple wing back accent chair, this piece will make a great addition in any room. Tapered wood feet are finished in Weathered Brown and a soft fabric covers the frame. The Accent Seating Accent Chair with Wing Back Design by Rooms Collection Two at Rooms Furniture in the Houston, Sugar Land, Katy, Missouri City, Texas area. Product availability may vary. Contact us for the most current availability on this product. This remarkable accent collection is sure to have the stylish seating you've been searching for. An assortment of upholstered chairs, chaises, exposed wood arm chairs and chair and ottoman sets have been gathered to create an accent collection designed to bring enhanced style, functionality and livability to nearly every room of your home. Seating is presented in nearly every shape and size, from luxurious chaises that invite you to linger to classic Louis style arm chairs that speak to your traditional side. An array of upholstery options lends a custom look to any space and makes finding a seating selection that suits your style a surprisingly simple task. Classic shapes, contemporary finishes and even a few retro styles can all be found in this versatile collection. The Accent Seating collection is a great option if you are looking for furniture in the Houston, Sugar Land, Katy, Missouri City, Texas area. Browse other items in the Accent Seating collection from Rooms Furniture in the Houston, Sugar Land, Katy, Missouri City, Texas area.